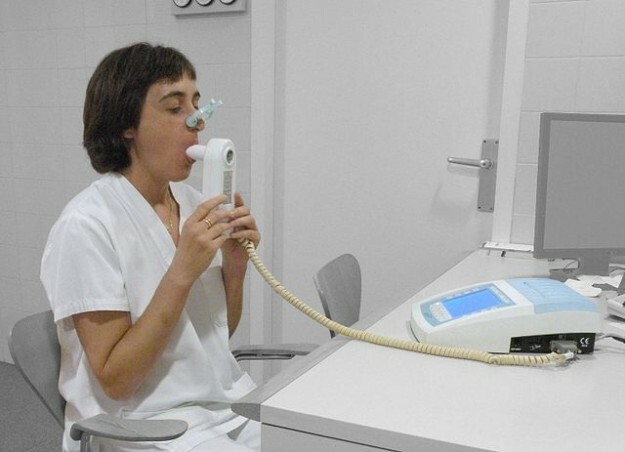 PFT (pulmonary function tests) can measure lung mechanics (spirometry and lung volumes) or gas exchange/diffusion function of the respiratory system. 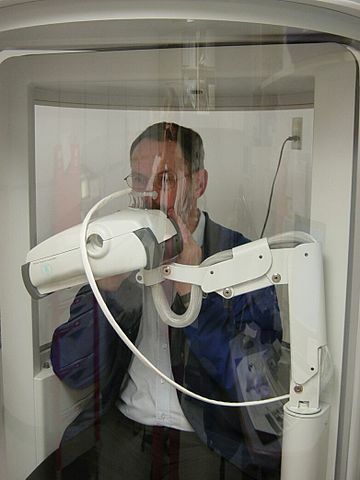 An indication of pulmonary function tests (PFT) is mainly diagnostic/prognostic. Recent eye surgery, abdominal aneurysms, hemoptysis, pneumothorax and recent myocardial infarction. 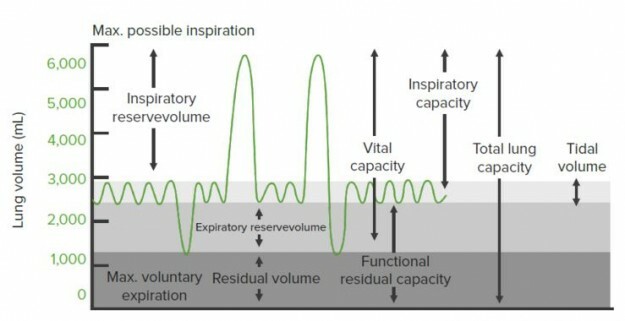 Functional Residual Capacity (FRC): Volume of air remaining in the lungs after normal tidal expiration. FRC = ERV + RV. Forced Vital Capacity (FVC): Maximum volume of air forcefully exhaled out after a maximal inspiration. This is classically reduced in restrictive lung disease; however, an obstructive lung disease with significant hyperinflation can also cause reduced FVC. FEV1: Volume of air exhaled during the initial second of the FVC maneuver. The ratio of FEV1/FVC: Normal value is > 75%. Decreased in obstructive lung disease. Values < 50% suggests a severe obstruction. 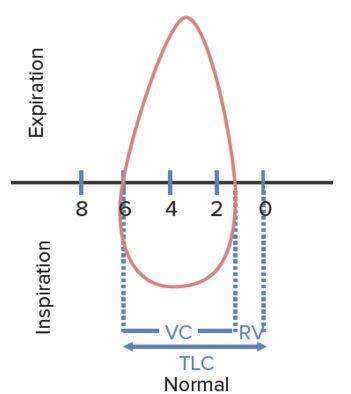 FEF 25–75% (Forced Mid-Expiratory Flow): Maximum flow rate during mid-expiratory part of the FVC maneuver. Expressed in L/min, it represents the status of small airways. Normal value is 300 L/min. 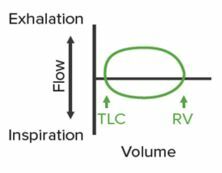 PEFR (Peak Expiratory Flow Rate): Maximal flow rate during the FVC maneuver occurs in the initial 0.1 sec. It gives a crude estimate of larger airway function. Normal value is 400–700 L/min. Important: Spirometry does not measure volumes such as FRC, TC and RV. Two patterns of results are identified: obstructive and restrictive diseases. Obstructive diseases, where a reduction in flow is predominant leading to low FEV1; however, FVC may be normal or low. Hence FEV1/FVC ratio is usually < 0.7 (less than 0.7). Reversibility: Increase in FEV1 by 12–15% on repeat spirometry, after administration of a bronchodilator (salbutamol) is a characteristic of asthma. Restrictive diseases, where a reduction in lung volume is predominant, which leads to low FVC; however, FEV1 may be normal or low; hence FEV1/FVC ratio is > 0.7 (may be > 1). However, this needs confirmation as RV can’t be measured by spirometry (low RV is the hallmark of restrictive lung disease). Flow volume loops are formed when a patient performs the spirometry maneuver, and a graph is plotted with the volume on x-axis and flow on the y-axis. The expiratory limb is usually represented as positive. Initial one-third of the expiratory flow is effort dependant; the latter part is effort independent; hence the shape. The inspiratory limb is entirely effort dependent, and the curve is smooth (useful to identify the phase of respiration if not labeled). In the obstructive pattern of the flow-volume loop, there is a decrease in the height of the y-axis, which represents decreased air flow. The volume remains normal or high (hyper-inflation). In the restrictive pattern, there is predominantly reduced volume, which is more prominent than the decrease in flow. These can be differentiated using lung volume measurement; the former will have a reduced TLC while hyper-inflation will show increased TLC. Hence, a confirmation by lung volume studies is necessary. N2 washout: Patient breathes 100% oxygen so that all nitrogen in lungs is washed out. The difference in nitrogen volume at initial exhaled concentration and final concentration gives the value of FRC. He dilution: Patient breathes from a reservoir containing a known volume of gas with a trace of helium. The inhaled helium gets diluted in the gas present in lungs. The concentration of helium in exhaled gas expressed in percentage, gives the lung volume. Example: the patient breathes 50 mL of helium and its concentration in exhaled gas is 1%, the volume of the lung is 5 litres. The patient sits inside an airtight body box with a known volume. The patient pants with an open glottis against a closed shutter. The increase in chest volume reduces the relative box volume and increases the box pressure. Measurements are done during expiration and hence FRC is measured. The principal behind plethysmography is Boyle’s law (P x V = K). Important: Lung volumes such as RV, FRC and TLC cannot be measured by spirometry. Patient inspires a dilute mixture of CO and is told to hold breath for 10 seconds. The amount of CO taken up is then measured by infrared analysis. CO is the ideal gas for this study as it has a very high affinity for Hb and very low plasma/lung concentration. It gives the ability of the lung to transport inhaled gas from the alveoli to the blood. Normal value is 20–30 mL/min/mmHg. 1. Which, of the following, is not true regarding a patient with obstructive lung disease? History of chronic smoking may be present. TLC, RV, and FVC are all high. TLC and RV are high, but FVC is low. FEV1, FVC, and PEFR are all low. Repeat spirometry after 15 minutes of bronchodilator therapy may show a 12–15% improvement in FEV1. What is the most appropriate interpretation of the flow-volume loop? Which of the following statements best describes this patient? Decreased FVC in this condition is due to obstructive lung disease. DLCO reduction is characteristic of restrictive lung disease. 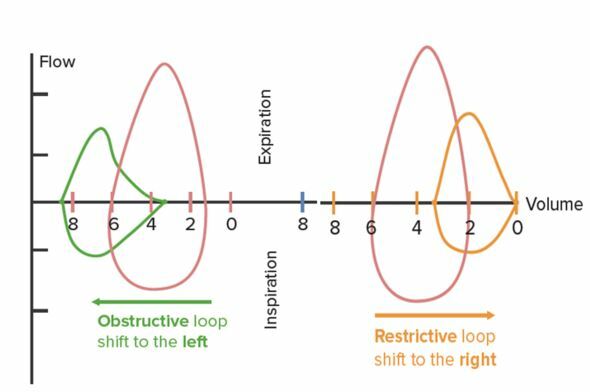 Flow volume loop will show a shift to left with increased volume. Low RV in this patient clinches the diagnosis of restrictive lung disease. Volume studies are expensive and unnecessary in such situations. Miller MR, Crapo R, Hankinson J, Brusasco V, Burgos F, Casaburi R,et al. General considerations for lung function testing. Eur Respir J. 2005; 26(1):153-61. Pellegrino, R., Viegi, G., Brusasco, V., Crapo, R. O., Burgos, F., Casaburi, R. E. A.,& Jensen, R. (2005). Interpretative strategies for lung function tests. European Respiratory Journal, 26(5), 948-968. Linda, S. C. (2007). “BRS Physiology; 4th edition”. Lippincott Williams & Wilkins.